Tribal or clan warfare is still a major type of fighting that goes on in the world today. Campbell Ogilvy at the Battle of Arbroath is a historical novel depicting a feudal rivalry between clans in medieval Scotland. By examining the life of the time, the personalities involved, and the political realities, Robert Nock gives us an idea of how these feuds and battles can develop and how they can affect history. The story traces a few years in the life of Campbell Ogilvy from the age of 14 to perhaps only about 19, by which time he is a consummate warrior. 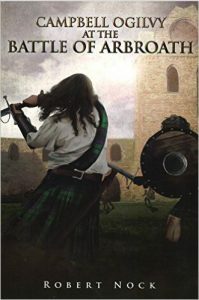 We see Campbell defend himself against personal attack, train for battle, receive a sword of his own, marry, and develop into a man able to challenge his nemesis Alexander in the Lindsay clan. As he does this, we learn about the customs in Scottish clans, the kinds of buildings they lived in, what they ate, the social order, the role of the church, and, most importantly, what the Scots valued. We learn something of how the Douglass clan became a rival in power to King James of Scotland. And we learn how battles were fought. The description of the fighting gives us a view of medieval battle strategy. Yet since the fighting is told by Campbell in the first person, we see mainly what is going on immediately around him, which seems true to life. We get a feeling of what it might have been like to be in the middle of a battle. The novel does not gloss over the blood and gore of battle. Campbell, for example, is a dutiful son and husband and wants to do what is right. Yet he is capable of saying, “Before my adversary had a chance to recover I swung the axe with all my might at his ankle. I can still remember the immense sense of satisfaction I had when I felt the axe cut deeply into his leg, breaking his ankle and causing my foe to drop to his knees.” As in the battle descriptions in the Iliad, we often get a close-up description of details such as where the spear goes in and where it comes out—and what it brought with it. Another similarity to the Iliad, also a story of clan warfare, is that revenge, getting even, is shown to be a major motivation for battle. Both stories assume that certain offenses can only be settled by violence. There are discussions and even “trials” of sorts in Campbell Ogilvy, but they lead to nothing. It is interesting how this novel moves one to see physical defeat of evil as a legitimate solution. This is a carefully written and researched novel. Readers will look forward to the next in the series.